Most people preparing for an interview will want to know the best ways of influencing the interviewer in their favour - what to wear, what to say and how to compose themselves. 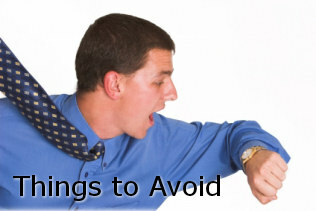 However, perhaps even more important than this is being aware of all those things you shouldn't do! Employers will have a long list of interview "no no's" and will be looking out for these when they meet you. To ensure that you are absolutely certain of all those things you should avoid saying or doing during your interview and to maximise your chance of success, follow these handy tips. If you have not done your research or not read the job description properly, your interviewer will be able to tell. Don't be tempted to 'blag' an interview, despite how much you think you already know about the company or the job role. First impressions count! Regardless of what you may wear outside of work, or how casually you usually like to dress, remember you are going to an interview and need to impress. Clean, ironed and professional looking clothing is the best way to go. Your interviewer will expect you to elaborate on the answers you give them, so avoid the one word answers. In direct contrast to the point above, a candidate who talks too much and is over-enthusiastic may irritate an interviewer. This may give the impression that you are difficult to control and find it hard to listen or keep on track. During an interview do not be tempted to complain about a previous colleague or manager. If you left your old job due to a conflict with a former boss, even if this was not down to you - an interview is not the time to bring this up! This could imply that you have difficulty getting on with people, which is not the impression you want to give to a prospective employer. Not only will your body language give you away, but also lying during an interview can be held against you later on, even if you get offered the job. Lying on your CV or application form can also be used as grounds for dismissal, particularly if the lie is about your qualifications or criminal record. A phone ringing or bleeping during a job interview is highly unprofessional and will most certainly be frowned upon by your interviewer. Swearing during an interview is a big "no no" - it will show you up as rude and disrespectful. You may think that you have a great sense of humour and would like to share that with your interviewer, but be aware that what you may find funny, other people may not! It's important to remember that a prospective employer is looking for things that show them you are the right person for the job. They don't want to know about your drinking habits or relationship issues, so keep away from these topics and focus on the skills that will secure you the job. Playing with your hair, fiddling with pens or tapping your fingers are all signs of nervousness and will also end up making your interviewers feel uncomfortable too. Instead, sit straight, keep your hands below your elbows and rest them somewhere comfortable so that all that your interviewer is paying attention to is what you are saying. Strong odours take a while to disappear, so before your interview try not to eat anything that has a tendency to linger, such as garlic or onion. Both you and your interviewer will be able to notice it, which could be an embarrassing distraction! Causing a confrontation during your interview is not a good idea! Even if you don't agree with something that has been said - hold your tongue. Nobody is going to want to hire somebody who is aggressive or argumentative, as this doesn't bode well for any future interactions with their team. Employers want to know that you are applying for a job because you have many things to offer them. They do not want to hear that your sole motivations revolve around salary and holiday time. If you can't be on time for an interview, it is highly unlikely that an interviewer will believe you can be on time for the job itself! No matter how well your interview goes after you arrive, you will always be the candidate who 'got there late'. So if the train breaks down before you get there or you get stuck in traffic - remember to call ahead in plenty of time. The above list is by no means exhaustive and the likelihood of coming unstuck due to all of these 'things to avoid' during an interview, can be minimised through proper preparation and a little common sense!